Today’s consumer, somewhat fed up with the mediocre quality of meat that is finding its way into the butcher cases at large supermarkets, are searching out quality meats that are better tasting and more nutritious. This demand for quality is fueling the grass fed beef movement. But other specialty meats are also hitting the dinner table, including bison. The Planted Seed bulk food store in Wausau started carrying locally raised bison meat, so I jumped a the chance to do a taste test between bison and grass fed beef. Modern Bison is a descendent of two different breeds of Bison that have roamed the Great Plains for hundreds of years. Although their numbers were decimated in the 19th century; bison, or buffalo have made a comeback as a domesticated animal. Bison are similar to beef in muscle structure, so you’ll find the same meat cuts from a bison as you would a beef steer. But the advantage of bison is that the meat is more nutritionally dense, with 76% less fat and cholesterol than beef and 68% less than chicken. Bison also has 35% more protein than beef, so you will come away being more satisfied eating less. 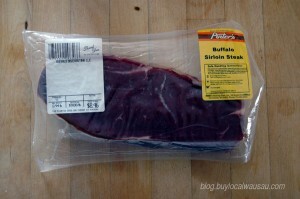 Bison meat is very lean, and its leanness is apparent right out of the package. 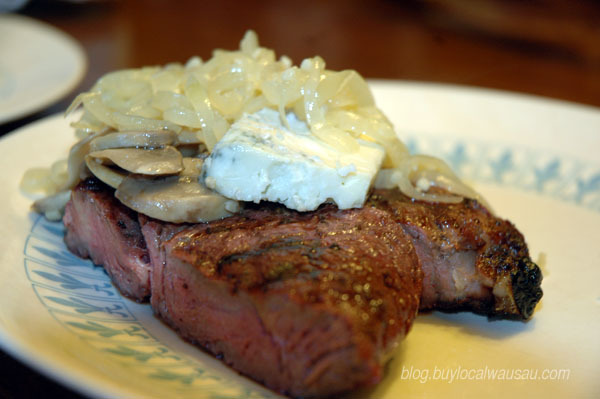 The Bison I taste tested was from a farm in Dorchester, WI located in western Marathon County. The meat is dark red with very little marbling, or fat structure. All the steaks come vaccuum packed to protect and preserve the flavor of the meat. I chose to taste test a sirloin cut; I had some grass fed sirloins in my freezer and wanted to compare similar cuts of bison and beef. Cooking Bison, and grass fed beef for that matter, is slightly different than cooking traditional feedlot beef. Bison will cook faster. The feedlot beef has a higher fat content so it takes more time cook. Also the higher fat of beef can take a higher level of heat, so you’ll want your pan or grill to be very hot to get a quick sear on the beef and then finish at a lower temperature. Doing this with Bison and grass fed beef will result in a burnt steak with a raw center. 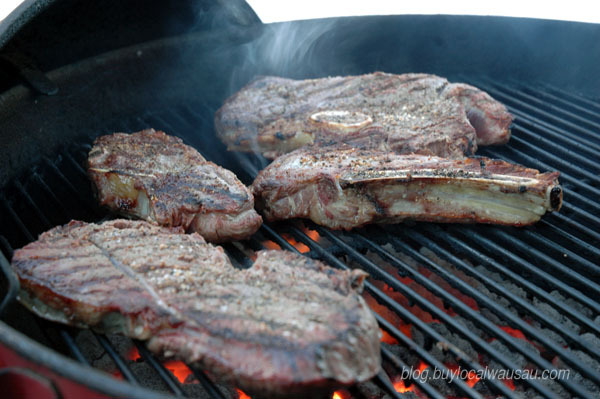 Instead of high heat, use a moderate grill temperature or medium high on the skillet and monitor the cooking process so that the bison doesn’t burn. 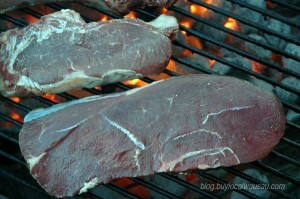 A great way to test the doneness without a thermometer is to periodically ‘touch’ the steaks to judge doneness. A medium rare steak should have the same resistance as touching your chin with your finger. If you like a more medium steak, then cook until the touch is similar to your nose. Medium well has the same feel as touching your forehead. This takes practice, so touch first and then do a sample cut to visually inspect how done the steaks are. For seasoning, I usually prefer the Montreal seasoning, but since I wanted the flavor of the meat to come forward, I just used liberal amounts of kosher salt and pepper. Once seasoned, the steaks where grilled over a charcoal fire under medium rare, about 12 minutes. On the whole, I found that the Bison had a slightly sweeter and more mellow taste than beef. The Bison did not taste ‘gamey’ but had a great lean beef taste. Even for it’s lack of marbling, the bison was very tender both to the knife and to the bite. Taste wise, it had a similar profile to the grass fed beef; the only thing that set the two meats apart was the smoother texture of the bison. If I was to compare the bison to a feedlot beef, the first noticable difference would be the lack of a greasy mouthfeel you get with feedlot beef. I think taste wise the flavor of the Bison reminded me of dry aged steak I’ve had at high end steakhouses. Bison is a great alternative to standard beef and had a slightly bolder, beefier, flavor than the grass fed beef. If you are looking for a more healthy alternative to red meat, or want to try a different steak flavor, I highly recommend giving Bison a try. Pinter’s Packing Plant Bison steaks and ground Bison are available locally at The Planted Seed in Wausau. Nice taste off! Next time you do one, I’d love it if you’d use my Artisan Beef Tasting Guide! BTW, was the bison also 100% grass-fed? The sweeter notes are often found in bison and interestingly, Wagyu-style beef. Thanks for your comments. Your artisan beef tasting guide sounds interesting. I never thought about the regional differences that could affect the taste of beef. Yes the Bison was also grass fed. Both meats where sourced locally, but from different farms. You may also enjoy kangaroo meat – even less fat.